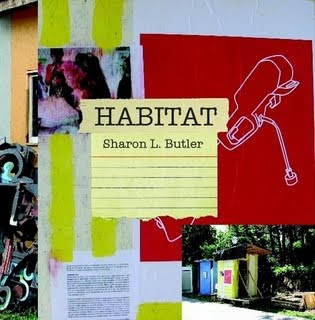 Sharon L. Butler, Habitat, 2010, cover, 32 pages, 7 x 7″ paperback. Designed by Sofia Nicander, edited by Jonathan Stevenson, with an introduction by Simon Draper. Print and e-book available at the Two Coats of Paint Bookshop. kork founder Chris Albert is widely recognized for his amusing press releases, so when he invited me to participate in the project, I readily agreed–just to see what he might write about my work. 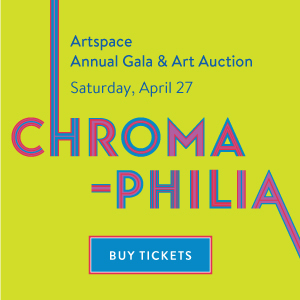 Here’s the press release for the show, which features Habitat, a recently completed artist’s book that documents my participation in Simon Draper’s Habitat For Artists project in 2008, and two small paintings. 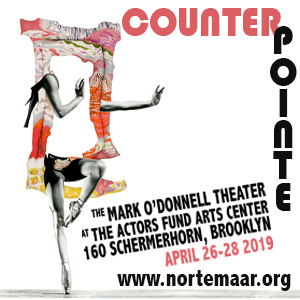 Any Art Star worth his laurels will tell you size matters and in keeping with that age old assertion, the kork project space in Poughkeepsie, NY is pleased to be dominated by two monumental paintings by Sharon L Butler. Size, of course, is relative. The two paintings and artist book on exhibit are the results of Sharon’s residency with the Habitat For Artists project during the Summer of 2008. The geometric paintings represent a portion of Sharon’s response to the experience of working in a rustic 4’x5′ studio space that was erected as part of an enclave of temporary studios on the grounds of Spire Studios in Beacon, NY. The paintings embody a sense of space much larger than the dimensions of the pieces themselves. The clusters of forms are like expanses of space and time folded origami-like to fit within the confines of the works’ borders. In this way, the paintings are an analog to the circumstance of their creation. 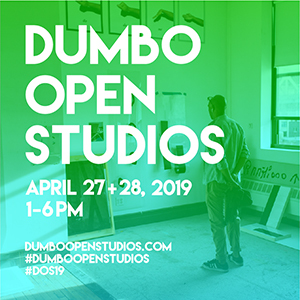 Presented with a workspace of extreme limitations of size and amenities, the artist compresses her impulses and intentions in such a way as to maximize the function of the tiny studio without compromising the essentials at the core of her vision. It’s an example of the alchemy of art where, in both process and product, the result is a sum greater than its parts. When confronted by the expansive habits of the art world elite that populate diary dispatches of Art Forum, it can be easy for a small project space existing on the wall of an accountant’s office to feel inadequate or somehow marginalized. Although we at kork are no strangers to the machinations of the international art world (kork’s Jan/Feb 2010 offering was a project by Canadian artist Anthony Easton), it would be disingenuous of us to deny that our lustful thoughts occasionally linger over the possibilities of what might be if only we could breakthrough into the big time art leagues that reside somewhere outside the confines of our base in Poughkeepsie, NY. But as Dorothy’s experience in Oz made her realize there is no place like home, Sharon’s Butler’s installation reminds us that a ‘no’ place can be home for creating and sharing work of significance, whether it’s in an outhouse-sized studio with fewer amenities that your typical outhouse, or a bulletin board with aspirations of some cultural import. 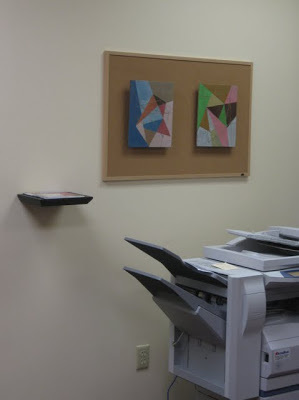 Creating a project space above a copy machine at an accountant’s office in Poughkeepsie is brilliant. Thanks, Chris, for inviting me to contribute. 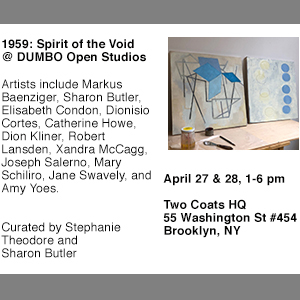 “Sharon L Butler Paintings,” curated by Chris Albert. kork, Poughkeepsie, NY. Through Oct. 31, 2010.